Superior cleaning of all glass (except electronics screens). It includes: (1) Glass and Polishing Cloth. Using just water the Glass and Polishing Cloth removes light grease, grime, ﬁnger marks and bacteria from all glass surfaces and adds a ﬁnal polishing touch to most hard surfaces. Used dry on water-dampened surfaces, the Glass and Polishing Cloth brings a smear-free, lint-free ﬁnish to windows, mirrors, stainless steel, chrome, granite, marble and all other shiny surfaces. Note: Colors may vary. It is true chemical-free cleaning. Using just water, e-cloths provide the best clean and are proven to remove over 99% of all bacteria (including e-coli and listeria) from hard surfaces. e-cloth ﬁbers attract moisture and oil, and the millions of ﬁbers lift and trap dirt, grease, grime, mildew and bacteria in the cloth. When cloths are rinsed and washed this material is ﬂushed from the cloth. Each cloth is guaranteed for 300 machine washings. e-cloth is a registered trademark of Enviroproducts LTD, a UK Company Copyright 2014 TADgreen, Inc.
Cloths can be machine washed with your regular wash using everyday detergent. Recommended to wash the cloths in Warm or Hot temperatures. Do not use bleach or fabric softener. Cloths may be hung to dry or tumbled dry in the dryer – do not use fabric softener. It is e-cloth’s fiber composition, fiber size, fiber processing and density of cloth that allows e-cloth to achieve extraordinary cleaning and drying, outperforming all other cleaning cloths. Most e-cloths are made from polyester (naturally attracts dirt and dust) and nylon (naturally attracts oil and water). That composition combined with a fiber density of over 1.6 million fibers per square inch enable the cloth to clean everything off of a hard service when activated with water. Clinical testing done by the internationally accredited Silliker Group has proven to remove 99% of bacteria including E. coli and Listeria using just water. The tiny fibers lock them away where the bacteria stay until the cloths are rinsed. After a rinse with warm water, just 0.01% of bacteria is reintroduced onto surfaces. 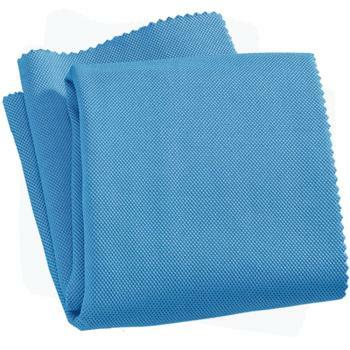 e-cloths are manufactured with very high quality raw materials. This makes these cloths so durable they are guaranteed for 300 machine washes. If washed weekly, that’s almost 6 years of cleaning. Household cleaners were the third largest category of substances associated with calls to poison control centers. Over half of the calls were regarding an incident involving children six years old and younger. Eliminating chemicals is good for you and your family. 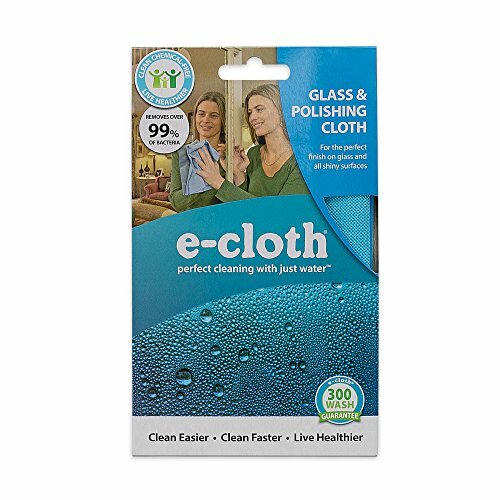 Using an e-cloth and just water can give your home the best clean it’s ever had with less effort and expense than your current cleaning method. Your windows and mirrors get a crystal clear clean and the glass is left lint-free and streak free. Your stainless steel surfaces will be smudge-free and fingerprint-free. Kitchen surfaces from countertops to sinks, stoves, and microwaves all clean up quickly and completely using just an e-cloth and water. The hidden benefit is no residues on counters and floors, no pollutants going down the drain, and no consumer waste clogging our landfills. An e-cloth and just water greatly reduces the amount of consumer waste that is being produced while you clean. In six years, how many paper towels, wipes, spray cans and bottles will you go through? Those materials go down our drains and remain on surfaces in our homes. The paper towels, cans and bottles end up in our landfills forever. An e-cloth and just water avoids all of this mess. If you have any questions about this product by E-Cloth, contact us by completing and submitting the form below. If you are looking for a specif part number, please include it with your message.